Saturday Night Live (@nbcsnl) has been on fire this past year with their political sketches. 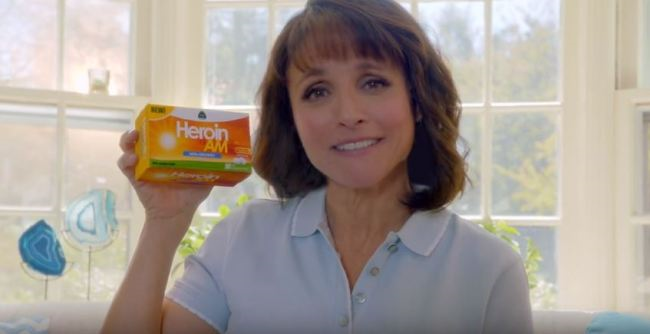 One of their fake commercials also touched a nerve this past spring when Julie Louis-Dreyfus (@OfficialJLD) took the lead in a skit advertising “Heroin A.M.” a fictional product that combines heroin, caffeine and cocaine. And while the reception of this sketch was mixed, in its own way, it shines a light on the opioid epidemic in the United States. In 2014 deaths from drug overdose hit an all-time high with 60% of them due to opioid overdoses. From 1999 to 2014 the number of deaths from opioid overdose quadrupled. Early in 2015 Health and Human Services launched an initiative to address the opioid epidemic which includes improving prescribing practices, improving access to treatment and expanding the use of naloxone. Naloxone is used to rapidly reverse the effects of opioids – an antidote to opioids. The Substance Abuse and Mental Health Services Administration has an Opioid Overdose Prevention Tool Kit in which naloxone plays a role. If an overdose or overuse is suspected – as evidenced by slow/stopped breathing, slow heart rate, pin point pupils – immediate medical attention is needed and naloxone can be given. Naloxone didn’t make the Saturday Night Live skit. Maybe this season it will.